(2013 Treasure Hunt) Bowflight falls in love again. Resting in the willow grove where she had just given birth, Finch had a smile on her face as she held their newborn cub. Willow had just finished nursing and was sleeping contentedly in her mother's arms. Bowflight ached to hold his tiny daughter in his own arms. Like Recognition, the ache was something wonderful - a need not even realized until the moment it arrives, and then it seemed as if it had always been there. Even without holding his daughter, he had realized in the moments since her birth, that he had alway wanted to be a father. He chuckled to himself - hadn't the two turns of the seasons given him enough warning? Finch rested her head on his shoulder, then whispered, "You want to hold her?" He couldn't speak - words would fail him. Sending, he replied, ** want you, want her, heart full, happy** and slid his arms under his beloved's as she gently placed Willow into them. Pulling his daughter close, he examined every part of her tiny face. She was fair-skinned, as all newborn babes were, but he imagined that she would have freckles one day. Her lips were full, but then they pursed together as her face tightened and a tiny whimper came out. Bowflight's heart squeezed, and he hoped his daughter would open her eyes, and then she did. Dark blue eyes peered up into his green. They looked at each other until Willow yawned and closed her eyes again, letting out a sigh of contentment. 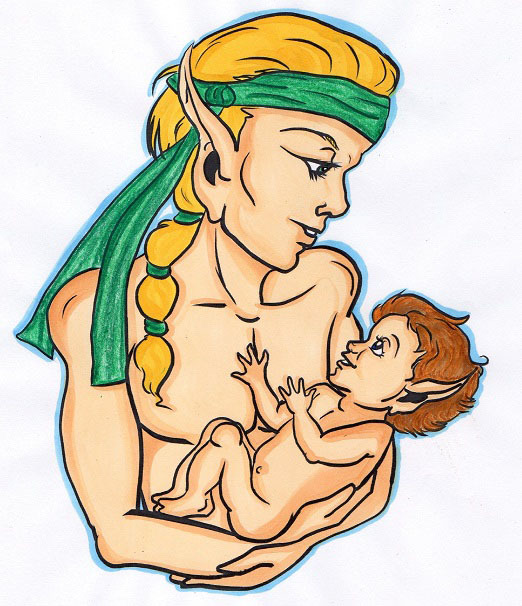 Bowflight echoed the sigh, pulled the infant closer, wrapped his free arm around his lifemate and enjoyed the moment.